a counting of how many people would be interested in this special event. If you would be interested in participating in this special event, please email Steve Short at nightskytours@hotmail.com. Steve is coordinating some of this early planning and needs to know how may folks would be interested in attending. So please email Steve with your interest. Peggy and I are definitely interested and want to attend and experience the 60 inch scope. I have attached Steve's email in the cc list above for your ease in responding. For those of you who don't regularly attend the OCA meeting, Steve is very involved with club activities and is running for club president this new year. Second, we've had to again postpone the project to image Polaris ( the North Star) due to the weather. I've found that the light pollution and evening clouds prevent me from seeing Polaris. Even the opportunity to observe in the darker OCA star party site was cancelled due to the recent heavy rain and weather. So, we will delay this project and report in a future email about why the star Polaris is worthy of a photo image. Third, it's important to have at least one photo in a weekly photo email so I wanted to show a substitute astro image this week. I noticed when I would look outside to see if Polaris was visible, and it was not, that I could usually see pretty well just straight overhead. I guess there is less atmospheric absorption and less light glare from street lights when I am looking straight up and overhead. Incidentally, the stars in Orion's Belt have magnitudes between 1.7 and 2.2, and Polaris is right in there with magnitude 2.0. So this week's photo image is of the constellation Orion. Orion is so large, it's listed as a 36 arc degree object, that you are not going to be able to see the whole constellation in a telescope. My Celestron, even with a 6.3 focal reducer on it, only has a field of view of about 1/2 degree, the same angular size as the sun or moon, so I didn't use the scope. Instead, I used my tripod mounted Canon DSLR, without any tracking to capture Orion. 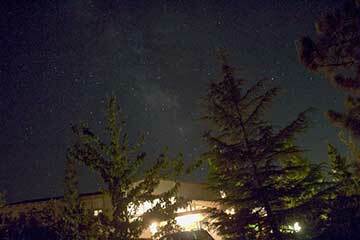 Even then I had to use the camera on its lowest focal length seething to get the whole constellation. I used an 8 second exposure with Fstop = 5.6, manual focus and ASA 1000. Betelgeuse and Bellatrix in the upper portion seem ok, but see what I mean about Orion sort of just disappearing in the photo. Orion's Belt is pretty clear, and bright Rigel at the bottom right seems clear, but what are all the rest of the objects? Maybe, if I learn more about how to use Photoshop, I can suppress some of the lesser important stars or some such effect. Well, of course there is the flight path of the jet aircraft and it's lights, but look at the 3 or 4 fuzzy objects all in a nearly vertical row just below the belt. I think that one is a star and the other two are nebula, M43 and M42. Those objects are quite bright and deserve some telescope photo time. Next time perhaps. By the way here is a homework question. How fast is the airplane traveling? What is the estimated altitude? Can an estimate of the arc distance between the wing lights tell us the wing size and maybe identify the aircraft type? Anybody know if the aircraft flash duty cycle between the pattern of its colored lights is set by some standard that can used to help estimate distance? The observatory staff wishes everyone happy holidays.